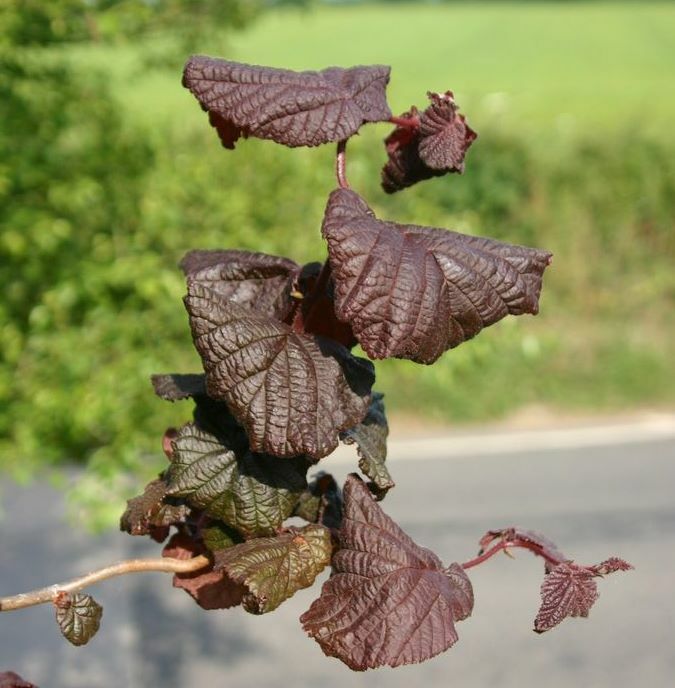 A recent introduction, the Red Corkscrew Hazel (Corylus avellana 'Red Majestic') differs from the standard Corkscrew Willow simply because it carries deeply ribbed red leaves and twisted branches. 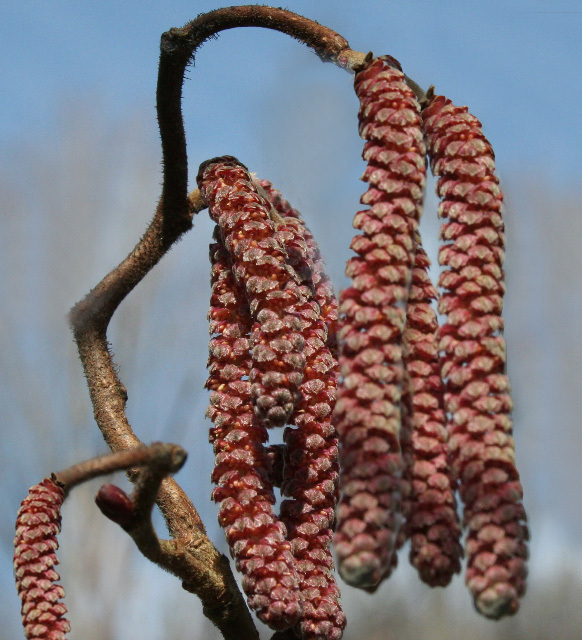 Its strangely contorted makes for a spectacular display along with the unusual Red Catkins in February followed by red nuts which you are unlikely to see because of thieving squirrels. 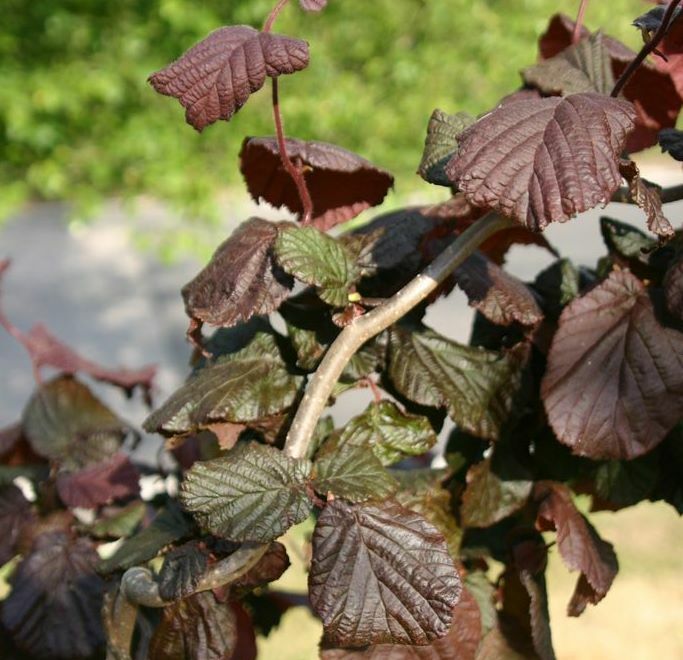 Many catalogues containing this Hazel tree state that "it gets people talking" but we didn't think that was a good thing if they were saying things like "stop whipping me with that Hazel Branch" and "who are you and why are you in my shower holding a red tree". Our Red Corkscrew Willow trees are supplied at a height of between 1.3m to 2.0m and in a 5-15 Litre container, which means that the tree can be planted any time of the year and with better results than either bare-root or rootballed trees. Expect the leaf colour to change from purple in the spring, red/green in the summer and darker purple in the the autumn. The perfect tree to pretend you know what you are doing when the neighbours are watching. You can hack away to your hearts content without fear of permanent damage. If you take it down to a few centimetres above grass level, we would suggest you are pushing your luck. 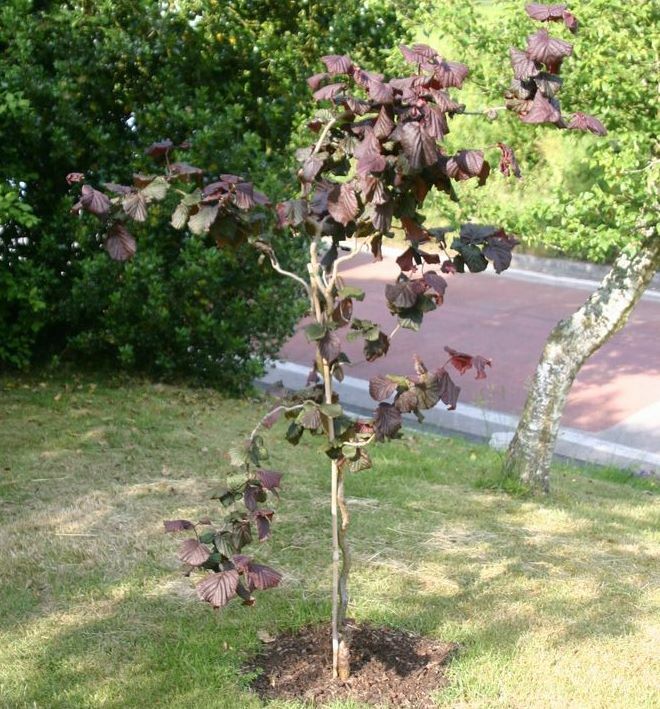 Being chalk and clay tolerant, you can plant this hazel tree almost anywhere in well draining soil. Before we are challenged on this statement, we mean in the UK, in the 21st Century and no we have not taken into account alternative time lines, parallel Universes and unexpected orbital change towards the sun. Fully UK hardy so you can live anywhere in the country and plant one of these. Before planting, thoroughly water the tree in its pot. Dig a hole twice as wide and slightly deeper than the pot it came it. If you are using compost or well rotted manure, mix it 50:50 with the excavated soil. Remove the tree from its pot. Place enough of the excavated soil back in the hole to ensure the rootball top is in line with the surrounding soil. Fill the voids in layers, firming as you go. Carry out a rain dance and/or water well. If planting in the Summer and you are getting prolonged periods of strong sun, water every couple of days. Other Information About Corylus Red Majestic That No One Reads But We Took The Time To Find It So We Are Publishing. Originated in Gerturkope which is the politically correct way of saying different websites stated Germany, Turkey and Europe and we were unsure. The Corylus Red Majestic Catkins can be used as emergency ear rings.